Cary Grant is a TMP favorite, and 1942’s The Talk of the Town is one of my favorite pictures from Cary’s filmography. He stars as Leopold Dilg, a man accused of arson. Sure he’ll be convicted, he decides to make an escape. He decides to hide away in a cottage, owned by Nora Shelley (Jean Arthur), a young teacher. Little does Leopold know, he’ll soon be getting a roommate: Nora’s summer tenant, law professor Michael Lightcap (Ronald Colman). Nora decides to help Leopold, hiding him away in the attic of the cottage. But will they be able to pull off this scheme with Michael living in the house? The Talk of the Town has a great cast — that goes without saying. It’s also incredibly well-written, both funny and dramatic, with a script by Irwin Shaw (Easy Living, 1956’s War and Peace) and Sidney Buchman (Here Comes Mr. Jordan, The Group). Magazine ads for the film promised “Screen comedy so gay… drama so thrilling… love so exciting… it will be the talk of YOUR town!” But did the critics agree? Variety gave the only lukewarm review of the film that I was able to dig up. The publication gave props to George Stevens’ direction, but complained that the story didn’t quite give the great Cary Grant enough to do. Bosley Crowther of The New York Times praised the script as “smart and lively,” also saying that the film “is going to make a lot of people laugh and feel good.” Crowther preferred 1941’s similar-in-themes Here Comes Mr. Jordan, but still found The Talk of the Town to be highly enjoyable. I watched this one a few months back…what fun! 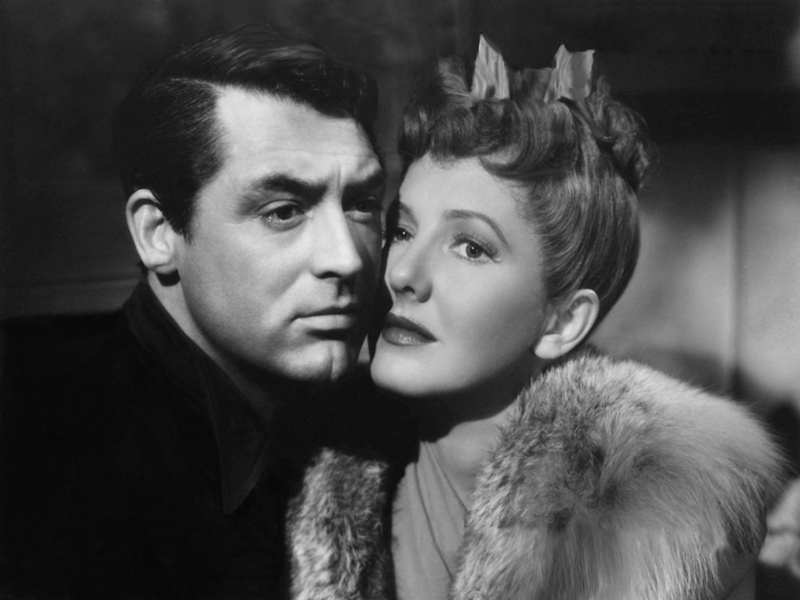 All three leads were so good…I’d forgotten how much I liked Jean Arthur (and yes, that other guy, too). I think that would be my favorite of hers, ‘The Devil and Miss Jones’. And still so many of hers I have yet to see! I have Netflix now, and do you think they have a giant collection of her films for me to choose from? I just checked: nope…just ‘Shane’, which I’ll watch again. Not sure what’s happened to Netflix since I’ve been away, but they have NO selection, at all. Only ONE Clint Eastwood film? Come on! It’s pretty bad! Their DVD service has a lot of great titles but I really only use the steaming for TV shows and newer titles now.